The mystery that transpired upon this day awes not only the human mind; it likewise astonishes all angelic, exalted minds. They, too, are amazed at how God, Who is without beginning — Who is unencompassable, unapproachable — how He could lower Himself to the status of a servant and become a man, without ceasing to be God — and without in any way diminishing His Divine glory. How could the Virgin contain within Her most-pure womb the unbearable fire of Divinity and remain unscathed — and, throughout all ages to come, be the Mother of God-incarnate? 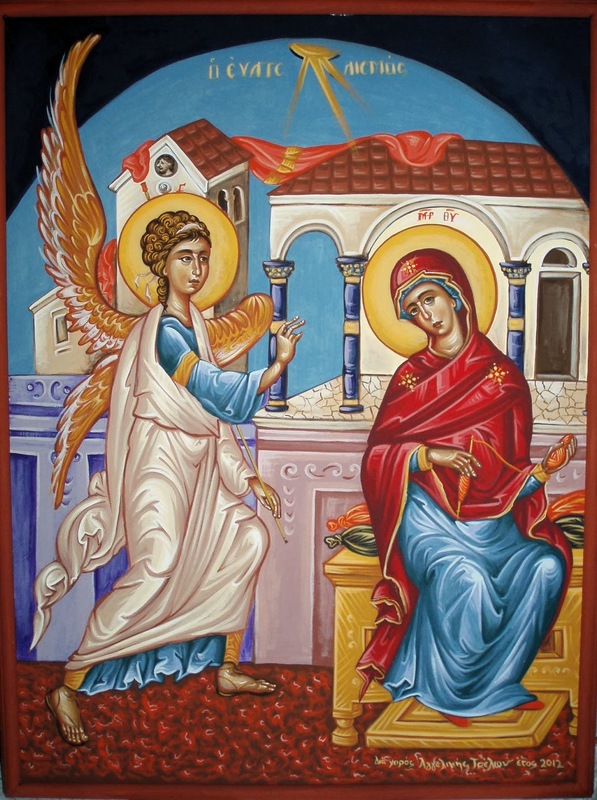 So great, so marvelous, fraught with such Divine Providence, is this mystery of the annunciation to the Most Holy Virgin by the Archangel [Gabriel] — and the incarnation of the Son of God from Her! Rejoice, O ye who are earth-born; rejoice, especially, ye faithful Christian souls — but rejoice with trepidation in the face of the magnitude of this mystery, being encompassed by the filthiness of sin. With pure hearts and lips, magnify the Mother of God, Who is magnified and exalted above all creatures, Angels and men; Who is magnified by God Himself, the Creator of all — and remember that the mystery of the incarnation of the Son of God, and of His becoming man, was accomplished for our salvation from sin, from the curse that was rightfully pronounced upon us by God, in the beginning, by reason of our sins, and from temporal and eternal death. With peace and joy, receive ye the Lord, Who comes to us in order to establish upon earth, in our hearts and in ours souls, the kingdom of heaven, the kingdom of righteousness, peace and joy in the Holy Spirit (Rom. 4, 17) — and come to hate divinely-detested sin, impurity, incontinence, pride, hardness of heart, lack of mercy, self-love, satisfaction of [the cravings of] the flesh, and all unrighteousness. Christ descended to the earth in order to raise us up to heaven (Akathist to the Mother of God, kontakion 8). Let us, therefore, being nailed down to the earth by the passions of life, incline our heads towards heaven, whither it is that the Lord Jesus Christ desires to raise us all up, and lift up the eyes of our heart. Lift up the heart! Long enough have we crept along the ground, like worms, in our thoughts and in our hearts. It is true that we are insignificant worms, according to our sins, although our souls have been created in the image of God, which we have disfigured by our sins, and which we must invariably re-instate through sincere penitence while we yet live. If is necessary that this image of God, like the sun, shine forth within us as it did in the beginning, when Adam and Eve alone had been created. It is for this purpose that we have been given life; it is for this reason that our life continues on, that we are joined to God’s Church and participate in her divine services, mysteries and fasts. Behold: how the image of the Ever-Virgin Mother of God gleams! Yet, She is also human…. What exalted Her to such incomparable heights? What made Her so glorious and so great — loftier than the Cherubim and more glorious than the Seraphim? It was the three supreme virtues: humility, purity and a fiery love for God — a love that is alien to earthly, to external, love. She Herself confesses that the Lord has looked upon the humility of His hand-maiden (Luke 1, 48). Do thou also, O Christian, begin to love, and implant deep within thine heart that humility which is divinely-pleasing; acquire also, though exerted labors lasting thine entire life, a purity of heart — do this by [means of] fasting, prayer, meditation upon God, tears, and especially by a frequent and worthy communion of the holy Mysteries of Christ. Begin, also, to love God, thy Creator and thy Saviour, with all thine heart, and prefer nothing that is in the world to His holy love. Meditate ever upon Him and upon His wondrous works; live Him and breathe Him; nourish thy soul with Him,; attire thyself in Him; purify thyself, enlighten thyself, sanctify thyself, establish thyself, adorn thyself, praise thyself, console thyself, through Him. By means of Him, vanquish the temptations and impositions of foes, visible and invisible. Whatsoever ye do, do all with thought of Him, and for His sake. Wheresoever ye might be, be everywhere with Him, as He is always with us, being everywhere, and filling all things. If thou comest to love the Lord in such a way, then in thee also shall the Lord be magnified — and the Lord shall magnify thee, as the holy Church says on His behalf: those who glorify Me, I shall likewise glorify (“Epistle of Tarasios, Patriarch of Constantinople, to Pope Adrian of Rome”). Learn, O Christian, to hate, to humiliate, to annihilate every sin within thyself — and the Lord of Glory shall be magnified in thee, and thou shalt be great before God and men; begin to love humility — and the Lord will exalt thee. Amen.